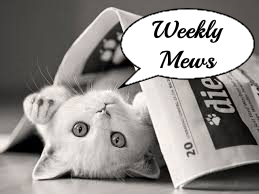 I am linking up to the Sunday Post hosted by the wonderful Kim of Caffeinated Book Reviewer, where participants recap our week, talk about what we are reading, share any new books that have come our way, and whatever else we want to talk about. 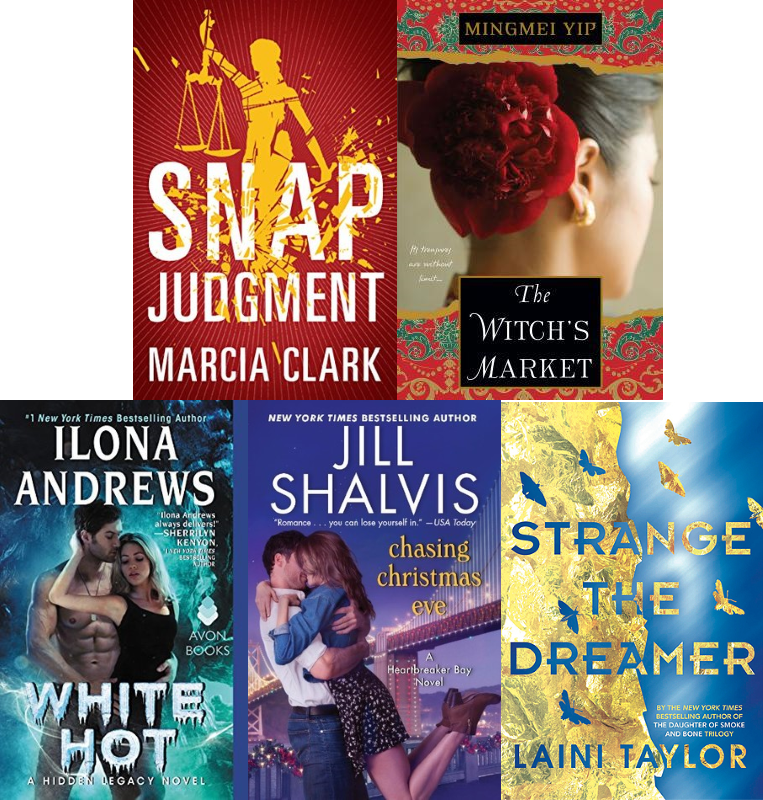 I am also linking to Stacking the Shelves hosted by the great Team Tynga's Reviews and Marlene of Reading Reality a meme in which participants share what new books came their way recently. 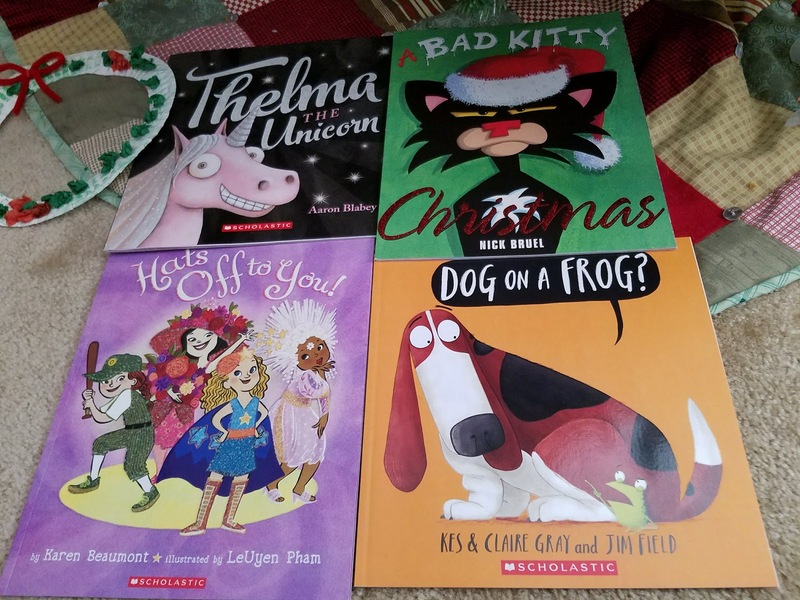 As well as Book Photo Sunday, hosted by the sweet Ronyell of Rabbit Ears Book Blog in which participants post photos of their own books. Happy New Year! I hope 2018 has gotten off a great start for you all. Mouse ended up staying up the entire night, her first time watching the ball drop at midnight. In past years, we have celebrated East Coast time (9 p.m. our time), and been well asleep by midnight. You can bet she slept in late the morning after. New Year's Eve night, we stayed up and played Just Dance, enjoyed chocolate fudge sundaes, banged our pots and pans at the stroke of midnight, and toasted in the new year with apple cranberry sparkling cider. Did you do anything special to bring in the new year? What I Am Reading: I am racing through Betrayed by Karen E. Olson at the moment, and expect to finish this weekend. It's the third book in her Black Hat Thriller series, and it has me on the edge of my seat. I am also now all caught up for the Les Misérables read-along. I have a feeling my problem will be not jumping too far ahead given how short the chapters have been so far. What I Am Listening To: I haven't yet jumped back into The Couple Next Door since I left off before the holidays, but I plan to do that Monday on my short commute to work. I am anxious to dive back in. It's very good so far. What I Am Watching: This week my daughter has been in control of the television. We recently watched Radio Rebel, Labyrinth, The Great Fairy Rescue, Pirate Fairy, Secret of the Wings, and The Grinch Who Stole Christmas. We have plans to see Coco today. I hear it's really good. What I Am Worried About: My mom has her second surgery the end of this coming week. Please keep her in your prayers and thoughts. What I Am Looking Forward To: I am also look forward to the new year, sort of. On the global front, I have big concerns, but in my personal life, I am looking forward to seeing what the new year holds. I got started on my bullet journal (bujo, I guess it's called for short? ), and am looking forward to applying that to my life. I had a little too much fun putting it together, although it's nothing fancy. I used a smaller journal than I probably should have, but it was one I had handy. Do any of you bullet journal? How is it working for you? What I Am Grateful For: My mom's help and presence these past three weeks. My daughter's cheerful spirit. Good books and cuddles from my cat. Are you ready to help me decide what to read next? 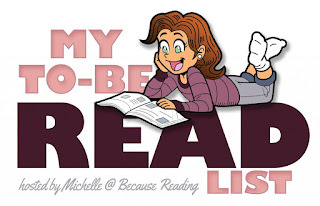 This is my third year participating in My TBR List, and I am excited to see which books you choose for me this year. 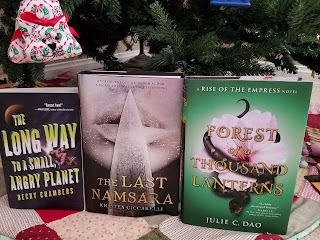 All three of this month's TBR selections are on my list for the #COYER Winter Switch Challenge. 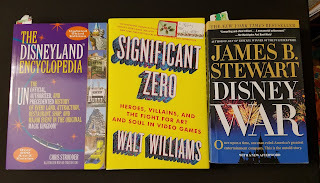 I am in the mood for a fantasy novel and thought these three sounded especially good. Magic, the fae and dragons? Who can resist? How to choose?! Rule #3: Don't stare at invisible faeries. Aislinn has always seen faeries. Powerful and dangerous, they walk hidden in the mortal world. Aislinn fears their cruelty - especially if they learn of her Sight - and wishes she were as blind to their presence as other teens. Rule #1: Don't ever attract their attention. But it's too late. Keenan is the Summer King, who has sought his queen for nine centuries. Without her, summer itself will perish. He is determined that Aislinn will become the Summer Queen at any cost — regardless of her plans or desires. Thank you for voting! I hope you all have a wonderful January and Happy Reading! © 2018, Wendy Runyon of Musings of a Bookish Kitty. All Rights Reserved. If you're reading this on a site other than Musings of a Bookish Kitty or Wendy's feed, be aware that this post has been stolen and is used without permission. 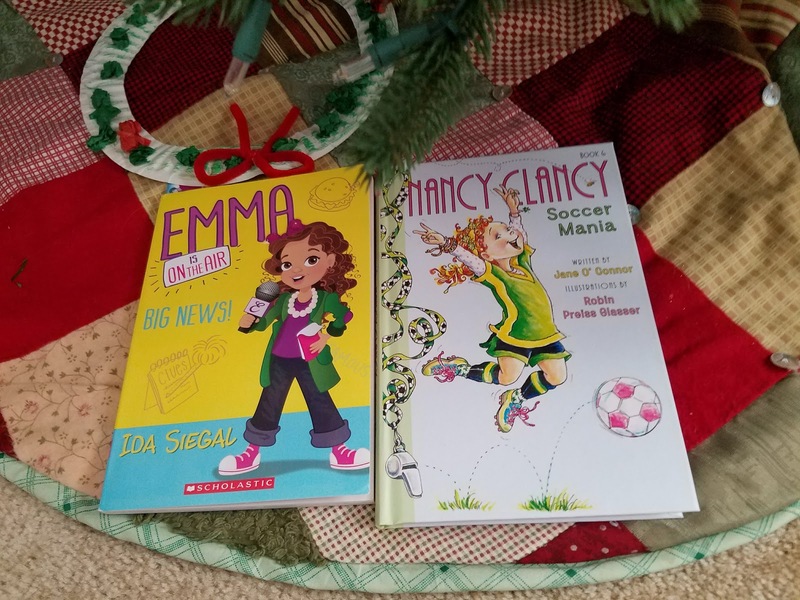 Wow, you had a very bookish Christmas. 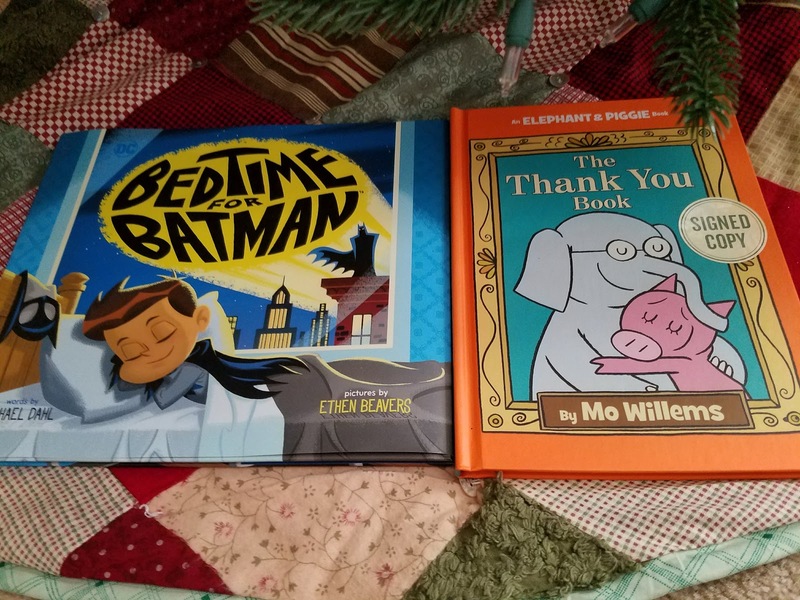 Each of my guys received one book but I didn't get any. Mouse has one up on me - I was in bed asleep when 2018 started. Our neighbors had a get together outside around their fire pit but we didn't go because it was so cold out it didn't sound like fun to me. Kathy - Mouse especially made out. :-) We haven't yet read all her books, but close to it. I imagine you'd want to stay inside with the cold weather you've been having! I hope you have a great week, Kathy. Thank you for stopping by. Lillian - Thank you for voting! I've had Wicked Lovely on my shelf for years, and it's been awhile since I last read a fae book. I think that would be a good one if it wins. Have a great week, and thank you for stopping by! Happy New Year!!! Wow lots of good new books. I voted for Clean Sweep because I love that cover. Have a great week!! Grace - Thank you for voting! I've been wanting to read Clean Sweep for awhile now. I have the books to follow too--so sure I am of liking it. Haha. Thanks for stopping by, and have a great week! I've heard wonderful things about Wicked Lovely so my vote went there. I hope you have a great weekend. 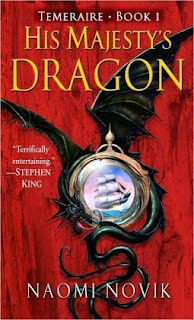 I don't read much fantasy, so I based my choice solely on the cover - Wicked Lovely. I think that's a really pretty cover! Tara - I did that a few times today in the polls too--voted based on cover. :-)Thank you for voting! I hope you have a great weekend, Tara. Thanks for visiting. Wendy, first of all, may I say that I'll be keeping your Mom and all of you in my prayers for her upcoming surgery. Hope all goes well and it is very successful. Secondly, what a great family haul of books and DVDs! 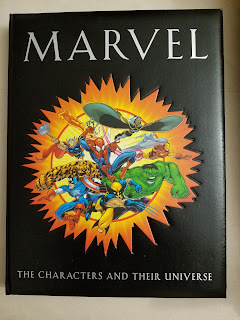 Love the Disney books your husband got - might have to take a look at those. Thirdly, I voted for CLEAN SWEEP - that will fit with your 'witch' challenge, won't it? And do you know that I'm pretty sure Ilona Andrews lives in the Austin area. And I'm pretty sure she did an event at the branch library where I volunteer and worked. It was a couple of months ago and I was only vaguely aware, but...I might need to check out her books. Kay - Thank you so much, Kay, for your kind thoughts and prayers. She had to head home today after her visit to keep all her doctor's appointments this coming week. I really wish I could be with her right now. Thank you for voting! 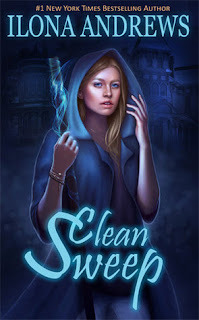 Clean Sweep would fit with my witch challenge, and I just love Ilona Andrews' books. It's a husband/wife team, and they write one of my favorite urban fantasy series. That's cool that they were at the library where you volunteer. I would love to meet them someday. Lots of good looking books. Enjoy! Kelly - Thank you! And thanks for stopping by! You got a great haul for xmas! I voted Wicked Lovely! :) Can't wait to see which one wins! Michelle - My husband and daughter especially made out. :-) Thank you for voting! I can't wait to see which one wins. Have a great week, Michelle, and thanks for stopping by! Wow! A lot of beautiful looking books. I hope everything goes well with your Mom. Chrissi - Thank you so much! I am hoping things go well for her too. We're all pretty nervous, but staying positive. Have a great week, and thanks for visiting! Happy New Year! What wonderful bookish Christmas. I hope your mom's surgery goes well. I do bullet journal and I'll be sharing my spreads and things on the blog sometime this week. I also have a instagram just for my bullet journal its @asplannedbytina. I voted for Wicked Lovely. The cover is gorgeous. Tina - Happy New Year to you as well! And thank you for your positive thoughts for my mom. I look forward to seeing what you are doing with your bullet journal. So far I've been good about keeping up, but we shall see how it goes as time passes. I am now following you on instagram. Thanks for sharing! Thanks for voting, and I hope you have a great week! Happy New Year! Glad you had a nice start to the new year. And yay for Long Way to A Small Angry Planet and Forest of a Thousand Lanterns (that one looks so good). Also The Magicians! I still need to watch S2. Best of luck with your mom's surgery! Sending prayers and positive thoughts her way. Greg - Happy New Year to you as well! I am really looking forward to reading Chambers book and I couldn't resist Dao's. Thank you for the good wishes and prayers for my mom's surgery. She's having an EKG on Wednesday, which I think she is more nervous about than the actual surgery. I hope it goes well for her, and wish I could be there with her. :-( It's hard living so far away during times like this. Have a great week, Greg. Thanks for visiting! Happy New Year! You got some fantastic books! I hope your mom's surgery goes well! I voted for Clean Sweep, it's the only one I've read and I really enjoyed it! Lynn - Same to you! 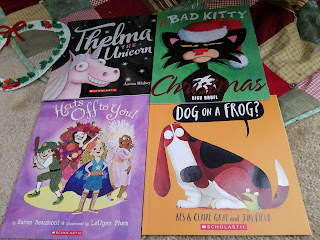 I am excited about the books I got. My husband and daughter have already dove into theirs. :-) Thank you for the well wishes for my mom--and for voting! Have a great week! Clean Sweep! I, too, hope all goes well with your mom. Debbie - Thanks for voting, Debbie! And thank you for the kind words for my mom. Have a great week, and thank you for stopping by. I hope your mom's surgery goes well. Looks like you will both be busy reading. 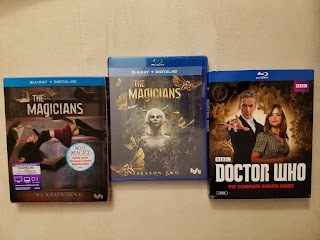 And that is a good season of Dr. Who. Ellen - I feel like I'll never get caught up with Doctor Who, but I keep trying. :-) Love that show. Thank you for your well wishes for my mom. Have a great week, and thank you for visiting! Happy New Year! I can see you had a wonderful Christmas celebrations. I hope the new year gives you many more things to celebrate. I pray for you mother. I hope her surgery goes well. And what a great haul! I hope you enjoy all of your new reads. Happy reading! Simant - Happy New Year to you as well! 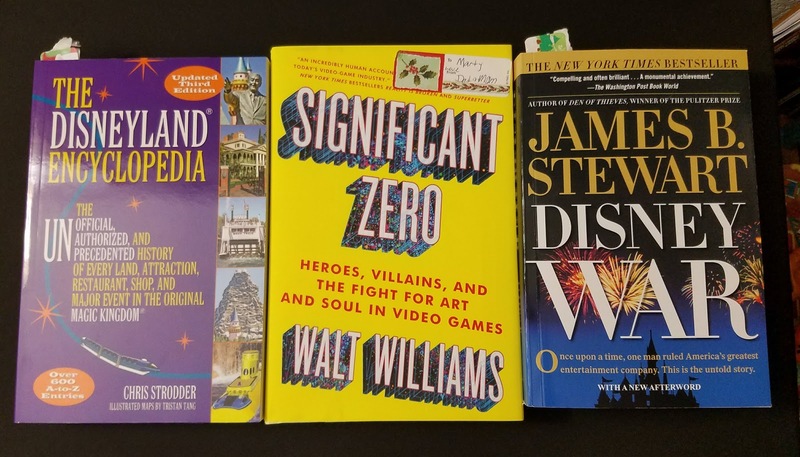 I am looking forward to the year in books. Thank you for your prayers for my mom. I truly appreciate it. Have a great week, and thanks for stopping by! Happy New Year! Now that's what I call great gifts! I love all those children's books:) I hope your mother's surgery goes well and her recovery is quick. Laura - Thank you! My daughter won't be hurting for books for awhile. :-) Thank you for your kind thoughts for my mother! She's still hoping to make it to Greece next month, so fingers crossed! Thanks for visiting, and have a great week! Anna - We did have a nice New Year's. It was right up our alley, anyway. :-) I hope you have a great week too. Thanks for stopping by! Regrettably, I don't have time for a bujo, but I've always thought they're really cool! And of course, I'm wishing your mother good luck with her surgery and a good week to you. I am not sure how much time I will have for a bullet journal either--but so far so good. Hopefully I won't lose interest. My husband is of the mind right now that it's just one more thing for me to do. We'll see . . . Thank you for the well wishes for my mom. I hope you have a great week too. Thanks for stopping by! Wow! You sure got a lot of awesome books! Happy New Year! Ronyell - My husband and daughter made out the best, I think. :-) Have a great week, Ronyell. Thansk for visiting. Happy New Year! It sounds like you guys had a fun one. My daughter and I used to play Dance Central often a few years ago and it was alot of fun. We spent a quiet New Year's at home, I baked a chicken and cooked a few sides so we stuffed ourselves and rented the movie Split, which was fantastic. Then we watched the ball drop on tv. So many nice Christmas books! Enjoy them! I saw the e-book sale myself but I refrained. lol. I couldn't resist the yarn sale though. Naida - Happy New Year to you as well! Your New Year's sounds really nice. I haven't seen Split, but I am glad you liked it! You were probably smart to refrain from the e-book sale. I got a little carried away. Thank you for your prayers for my mom. Have a great week, Naida. Thanks for visiting. Glad you and Mouse had a nice new year! I was asleep by midnight for sure! Have a wonderful week! 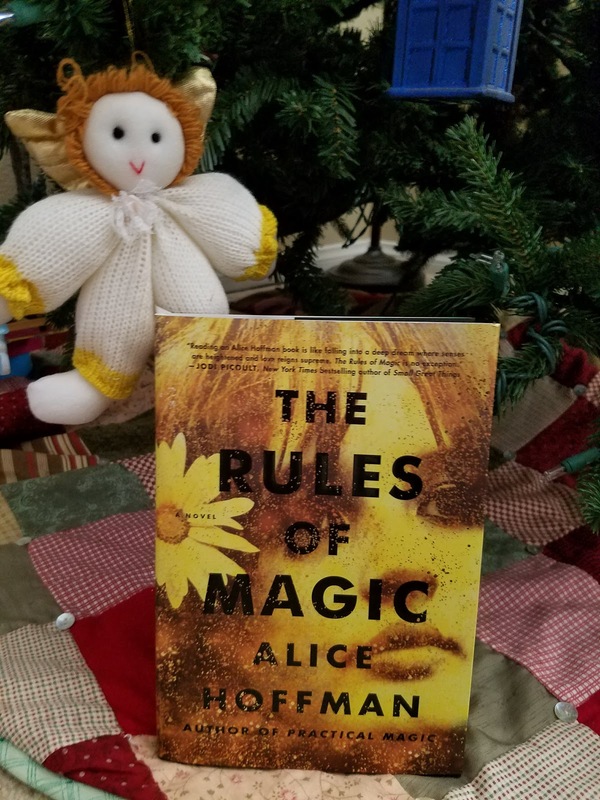 The Rules of Magic is a wonderful book. We rang in the New Year with peach champagne and the pups...and then were in bed by 12:30. It was cold and I don't feel like celebrating in the cold. I love the cover of Dog on a Frog. 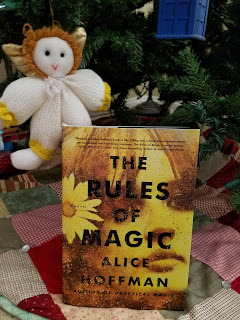 Barb - I can't wait to read The Rules of Magic. Your New Year's Eve sounds wonderful. I think my cat and my mom's dog were wondering why we were all staying up so late. LOL Have a great week, and thank you for visiting! Sending positive thoughts to your mother! I hope you enjoy The Couple Next Door as much as I did. I used to party a lot...I don't miss it. Reading and movies are my favorite things these days. I hope you have a great week, Laurel-Rain. Thanks for visiting! Jenea - Thank you for your kind thoughts! We're all hoping it goes well too. Have a great week! Thanks for stopping by. I'm doing a bullet journal this year for the first time - I love seeing what other people do, so I figured it would be kind of fun. Lauren - I might have pouted a little when I saw how many books everyone else got compared to me--but I made up for it with the gift cards I got. :-) Thank you for your well wishes for my mom. I appreciate it. Love all the new books! I hope you and your family enjoy them. I'll keep your mom in my prayers. Have a great week! Tiffany - Thank you! I think we will. My husband is enjoying the first one he's dived into and my daughter's read most of hers (with help). :-) Thank you for your prayers for my mom. It means a lot. I hope you have a great week too. Thank you for visiting! Sending good wishes & prayers for your mom's surgery! That's wonderful that you got to spend more time with her over the holidays and it looks like Mouse made out like a bandit for her library. Lots of books, love it! Hope you have a great week. Iliana - Thank you so much for your prayers and good wishes for my mom. She's a real trooper, but we all still worry. She made the eight hour drive home today. We already miss her. I hope you have a great week too! Thanks for stopping by. I'm sending lots of good thoughts and prayers for both you and your Mom! I hope that everything goes smoothly for her!!! I really, really, really need to get back to Karen Olson's series after loving the 1st book so much! You just reminded me that I need to read it ASAP :) It looks like you have tons of great reading ahead of you! Enjoy!! Samantha - Thank you for your good thoughts and prayers for my mom. We are all hoping for the best. I have a copy of Vanished waiting in the wings and so figured I should speed up my reading of the series. It's been good so far! I hope you have a great week, Sam! Thanks for visiting! I did stay up on NYE, although I was working on the blog and reading. I stayed up WAAAAAY too late, which I am still unable to get back on track from. I hope you have a great week this week! Charlie - That's how I probably would have spent it had my mom now been visiting. LOL I hope you have a great week too and are able to catch up on some of that sleep (I know how hard that is though . . . ). I listened to Wicked Lovely and enjoyed it. 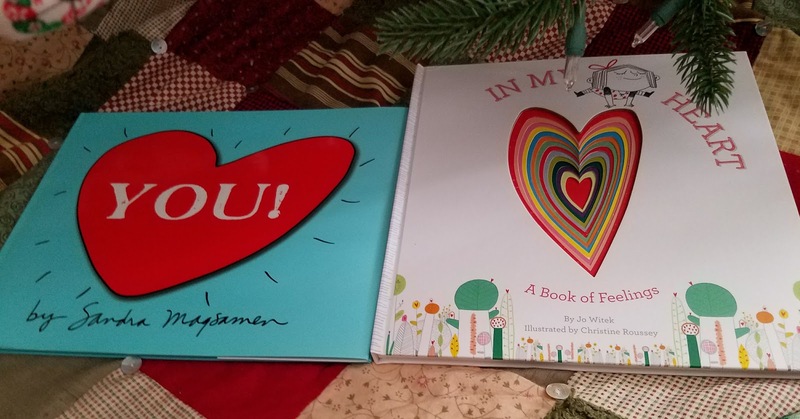 Looks like lots of books make their way to your home! Thoughts and prayers are with your Mom. Nise' - Thank you for your thoughts and prayers for my mom--and for voting. 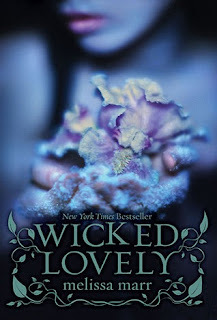 I love the title "Wicked Lovely." It has such a nice ring to it. I am glad to hear you enjoyed it! Hopefully I will too. :-) Thanks for visiting. Have a great week, Nise'! How fun that your daughter was able to stay up for the new year for the first time. I stayed up with a dog terrified by all of the fireworks. 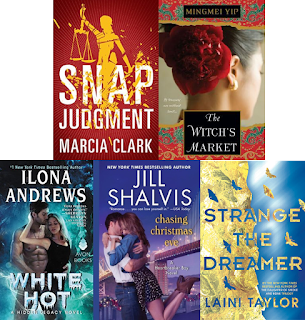 So many new books this week to keep you and Mouse busy! Enjoy and have a great week! Carole - She was so excited. Of course, she hadn't realized we were cheating her out of three hours before then. LOL there were fireworks set off here too, which got the neighborhood dogs barking. I hope all goes well for your mother's surgery, Wendy. Melody - Thank you! Her surgery went well, thankfully. 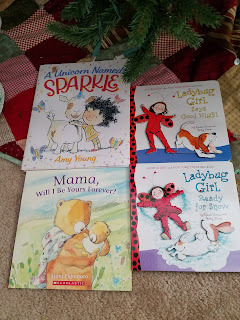 My youngest loves Lady Bug Girl and Fancy Nancy/Nancy Clancy! 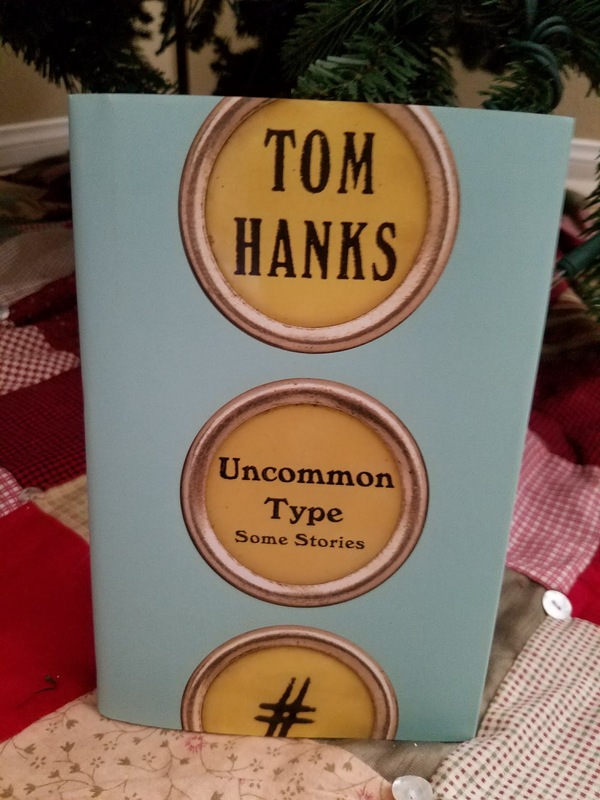 Great bookish Christmas! 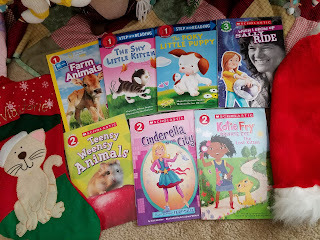 Chrissy - My daughter really loves those books too. She's enjoying the Fancy Nancy book right now, a matter-of-fact.